I can’t wait to see Thor: Ragnarok. If I feel any more hype for this movie, I’m going to explode, and if you feel the same way, you’re probably looking for some good Thor stuff to keep you occupied until the movie comes out. Well, I’ve got a recommendation. 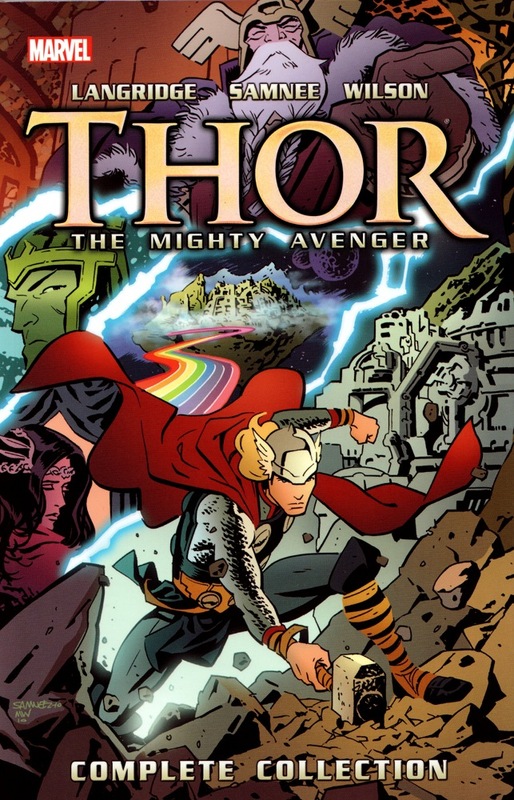 Thor: The Mighty Avenger is a complete collection set in its own self-contained world outside the normal Marvel Comics universe. You don’t have to know 60 years of Thor and Avengers comics history to understand what’s happening. It’s great for new readers, but long-time comics fans will appreciate the distillation of Thor’s story. Thor gets exiled from Asgard and has to learn humility, blah, blah, blah. You know this story. And yeah, the book is called “Thor,” but you could make the argument that Jane is the real main character. Poor Jane doesn’t always get the best characterization. In the first Thor movie, well… She’s not the worst love interest in a Marvel movie (Looking at you, Dr. Christine Palmer.) but she’s no Agent Carter or Pepper Potts. The second Thor movie tries to make her more important by having her get possessed by the McGuffin… instead of developing her character. It doesn’t really help. In the comics, Jane is wielding Mjolnir as the current Thor, but Thor: The Mighty Avenger proves that you don’t have to make Jane a superhero to make her interesting. The basic premise is that Jane works at a museum studying Norse history and runs into Thor right after he’s been banished to Earth. After he saves her from a drunk and angry Mr. Hyde, she invites him to sleep on her couch. She’s compassionate, stubbornly determined to do the right thing in dangerous situations despite her status as a squishy human, and overall is just genuinely likable. Eventually, she ends up helping Thor adjust to life on Earth and search for a way home, and they have a really sweet romance. Thor: The Mighty Avenger is a great introduction not only to Thor but to an array of other Marvel characters. Ant-Man, the Wasp, Captain Britain, Namor, Iron Man, and even Captain America make appearances, and the issues do a great job of giving you the gist of the characters in a fun way that doesn’t get bogged down by details. Watching them interact with Thor is fun, and throwing in Jane is even better. If you’re a Loki fan, you’ll like his portrayal in this comic. More mischievous than evil, he serves as an antagonist in some issues but isn’t an irredeemable villain. He’s ambitious, too clever, and his own worst enemy, but he’s a lot of fun whenever he shows up. So if you want a self-contained Thor story with great characterization, fun guest appearances, and an adorable romance, look no further. This book is awesome, and you should buy it. I’ll see you at the Thor: Ragnarok opening.